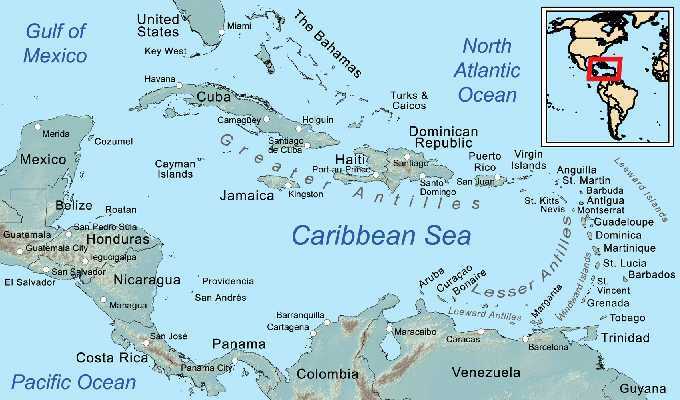 In 2005-2006 I worked on Curaçao, the Netherlands Antilles (NA). Back home I collected my analyses in the book The Political Economy of the Netherlands Antilles and the Future of the Caribbean (PENAFC, 2006), now out of print but the PDF is available on the web. The book is a supplement to the main analysis DRGTPE 2000 and now also CSBH 2012, see the About menu or the Video. The NA appeared to have a social security system similar to that of Holland. By consequence it has the same welfare state diseases, even though the NA is partly a developing country. The same solution approach of DRGTPE applies, with the abolition of the tax void and so on. There had been a spectacular crash of the bridge across the harbour entrance. The historical picture is on the front page, with compliments to Wim ter Hart. In 1889 Dutch engineer / economist A.J. Cohen Stuart coined an analogy about income taxation and the ability to pay: “A bridge must first bear its own weight before it can carry a load.” My analysis agrees that tax exemption must be set at the level of the net minimum wage and that Value Added Tax (VAT) be around 1%. Traditionally there is the theory of Island Economies that regards islands as sea-locked. Nowadays, however, sea transport technology and logistics cause ships to have often comparative advantage over trucking and rail. See the book Transport Science for Operations Magagement. The idea of an Economic Supreme Court per nation allows countries to have forms of Union that are more intelligent than the traditional models. Let us learn from the mistakes of the European Union. Just to be sure: PENAFC had no impact. On October 10 2010 the NA ceased to exist. It split into two new countries Curaçao and Sint Maarten and three “special Dutch municipalities” Bonaire, Saba and Sint Eustatius. The Island Economy still applies here: with more power to the local elite we already see a rise in corruption. Looking at the Caribbean, one cannot fail to see Cuba. It would be a prime partner in such a Caribbean Union. With the collapse of the Berlin Wall in 1989 and the end of the Cold War, one wonders why the boycott of Cuba continues now almost 25 years. There was the thesis van Peter van Bergeijk in 1991 that boycotts generally do not work and are counterproductive. This is an important thesis for this website Boycott Holland of course. A boycott does not affect the power elite much, who will tend to find ways around it. A boycott will affect the general population and reduce their means to resist against the power elite. A boycott could be effective for generally rich Holland when people get annoyed that the punch bowl is taken away and want it back. For Cuba it is counterproductive. This causes the question why the USA would continue to support Castro by a boycott that enhances his power over Cuba ? In PENAFC I speculated that Castro might have been involved in the assassination of JFK. Castro would have suffered so many assassination attempts upon his own person that he retaliated. The USA could not state this in the open since the popular anger to do something might cause a nuclear war with the USSR. These days the murder of JFK 50 years ago got general attention again. Of the various complot theories this Cuba option still seems the strongest to me. Why persist in boycotting Cuba 25 years after the end of the Cold War, while it is counterproductive in the first place ? Yes, I did not think about that angle. Well, there is one way to test this: Let the good people in Florida study the Van Bergeijk thesis. If their objective is to get rid of the Castro regime, their best policy option is to end the boycott of Cuba. PM. I rely on Van Bergeijk’s thesis in Dutch, 1991. I did not read the English version of 1994 but let me refer to (1994), Economic diplomacy, trade and commercial policy: positive and negative sanctions in a new world order. Edward Elgar. Most recent are the chapters in (2009), Economic Diplomacy and the Geography of International Trade. Edward Elgar. Earlier I called the period 1981-2007 “Keynesian years“. Deregulation, liberalisation and privatisation released huge flows of money looking for investment opportunities. Investors threw darts all over, and if some missed then they didn’t mind since some hit. Still, the outcome of this was only modest growth and employment. Nothing really huge, even a productivity slowdown. Now we are re-regulating again, and we face high unemployment. My suggestion for a solution is in the books DRGTPE and CSBH – see the About page – and an element are National Investment Banks. Paul Krugman in his column A permanent slump ? of November 17 2013 refers to Larry Summers who at the IMF annual research conference apparently made the same diagnosis of 1981-2007. But without the solution of DRGTPE, CSBH and those investment banks. It is a confirmation, though only a partial one. Facing a permanent slump without a solution is rather depressing. The summary of this weblog has already been given in the About menu plus the earlier post Cause and Cure of the Crisis. Now there is a Video as well, see above menu. The sound recording isn’t that good yet but I am learning how to use the software. My speech speed is rather slow, it doesn’t have the pitch as e.g. is common on TED or with some journalists. You can run the video at a higher speed up to getting me quacking like a duck and approximate that TED idea. My thanks go to YouTube, Microsoft Expression Encoder and Afsbinwin of Radioactive.com in particular for the present result. I also learned from the software of Diego Uscanga of aTube Catcher and the Audacity team for sound editting, and the Media Player Codec Pack, FFmpeg.org and WinFF (GUI) for converting MWV into MPEG4. It seems that MsEE allows edits and encodings to MWV that are okay for Ms Media Player but that can get stuck in YouTube Processing, so that you can wait for days for something to happen. FFmpeg / WinFF indeed render errors on timestamp ordering in such a MWV file. Repacking that MWV into ASF with Afsbinwin apparently removes such errors, and YouTube Processing accepts the file. The cost is, however, that the sound turns bad at particular places where there has been an edit (not all). This audio drop happens at the same spots both in Asfbinwin and in the conversion from MWV to MPEG4, so I presume that the main problem lies in MsEE indeed. Perhaps Bill Gates can look into this. While I was waiting for YouTube Processing, I had the chance to look at some videos of “the competition”. YouTube noticed that I was interested in the crisis and thus it presented me with recordings of George Soros, Jim Rogers, Peter Schiff, Richard Duncan, and so on, with various doom scenarios of world economic collapse. Especially the ticking National Debt time bombs draw attention. Deacon Swayne of the British magazine MoneyWeek has a 47 minutes “documentary” on The debt time bomb that is Britain. Though much of that “documentary” is accurate, it turns out to be a long commercial advising you to rely on MoneyWeek. My suggestion is that you watch my Video and check how much is explained of the crisis. It cannot be denied that Soros, Rogers, Schiff, Duncan, Swayne and others, with their state of knowledge, point to relevant angles in world developments. But they lack the synthesis in economic theory that is presented here. In the same manner, governments study the various scenarios of world development. Their vested interest is to enhance stability rather than scare mongering. You wouldn’t like it when Angela Merkel had a broadcast every week like Peter Schiff about her ideas about the impending world collapse and how everyone should work hard and save for the future. Nevertheless, these governments also lack the proper knowledge, due to the censorship of economic science by the Dutch government (that doesn’t know what it is censoring). I did enjoy the video by Bill Still on the Wizard of Oz. I knew from years back that the “Yellow Brick Road” was a reference to the gold standard, and so on, but Bill fills in historical details. It is also a serious issue whether money is in control by the state or by private banks, see my paper Money as gold versus money as water (2013). It is a no-brainer that money better be controlled by a democratic government. It is a logical mismatch when the supply of money is associated with a rate of interest. If a private central bank with a monopoly on money creates a supply of 100 bn dollars in paper bills for use by the general public, and this supply is returned by the public to the bank at the end of the year, then it is physically impossible that the public can also pay an additional 5% rate of interest in terms of said paper bills, since all 100 bn dollars in paper bills have already been returned. It gives curious psychological power to such a bank to demand that the 5% interest is paid in terms of its own bills, though everyone should start laughing that the bank demands bills that it hasn’t issued itself. The current arrangements for the US Federal Reserve and the Bank of England suggest that there is private profit taking at the expense of those governments for no good reason (except lack of economic understanding in parliaments). But it is incorrect when Bill Still suggests that issuance of money by the government means that there will be no National Debt. It is still possible that the government borrows from the public and builds up debt. It is advisable that the government does so, since e.g. pensioners would want a secure investment. That the current National Debts are excessive, is another story, see my Video. My proposal is to change “Santa Claus” into “Kidda Claus” and also allow for “Kidda Claudia”. This solves two issues of discrimination, namely those of religion and male chauvinism. A third issue is solved as well since Kidda Claus or Claudia don’t have to be Caucasian but can have any background. Since Kidda Claus can take any form, also the present Santa is acceptable, which should comform traditionalists. But institutions are encouraged to be politically correct. Hopefully Hollywood takes notice too. A gradual change is optimal of course. This proposal dates from November 12 1992 when I presented a story at the Benelux Science Fiction & Fantasy Convention. The PDF has been on my website for years, and in 2012 I turned it in a small booklet (in Dutch). The booklet is rather expensive because of the printing-on-demand setting so I am looking for a big publisher and retail market chain. 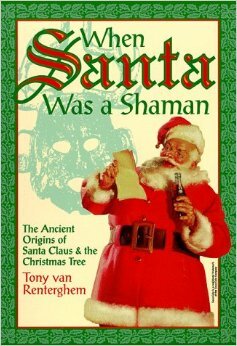 To understand the origins of Kidda Claus and Claudia, get the book When Santa was a Shaman by Tony van Renterghem. Arnold-Jan Scheer has an amusing video about celebrations all over Europe, also with brawls and beating of women. The celebration dates back to prehistory. The sun dies in winter and must be saved at midwinter. The spirits of darkness devour the sun and they must be shied away with a lot of noise or be caught in chains. Wodan rides the sky on his horse. Fertility is at stake too and therefor there must be offerings. Thanks to the big party, the sun recovers. We see this also in the icon of Father Time, who grows old and dies, and is reborn as the baby New Year. We see it also reflected in the birth of Christ, see my book The simple mathematics of Jesus (2012). When Christianity arrived, the Church tried to stop the heathen noise, brawls and offerings. The festivity was too popular however. For young men in particular the beating of young fertile women was too attractive. Therefor a priest took over the role of Wodan & shaman and joined the party to control the crowd. Saint Nicholas carries a staff just in case a beating is still required. In Holland Saint Nicholas still rides his horse and is surrounded by people with black faces. The spirits of darkness however have transformed into Moorish helpers with elaborate costumes of the Spanish court, from the 1500s when Holland was part of the Habsburg empire. Dutch children are told the story that Saint Nicholas lives in Spain and comes to Holland by steamship to celebrate his birthday of December 6. He rides the rooftops and his helpers come down the chimneys. In the USA, Santa Claus is no bishop anymore and has lost his staff, horse and black helpers, and now has elves and reindeer, but actually competes with Christ on December 25. The important comparative advantage of the Dutch celebration is that people write poems to go with their gifts, and that there can also be mockery gifts, e.g. a big box that contains ever smaller boxes. Family members may make fun of each other, and you are supposed to enjoy being mocked as much as all the others. Hence everyone has a high stake in designing a present. It is not just something from a shop but a personal gift with a targetted poem. The New Year cabaret show is the national Kidda Claus poem that makes fun of national events and politics. These elements cause that the celebration is hugely popular. An aspect is that the American Santa tends to give presents that are ever more expensive, and Dutch people tend to dislike expensive presents when they are not on the receiving side. Holland will not switch to Santa Claus. My proposal in 1992 was to change the Dutch “Sinterklaas” into “Kinderklaas” or “Kinderklazien”, and secondly the Dutch “Zwarte Piet” into “Malle Piet” or “Malle Pieternel” – translated as “Funny Pete” or “Funny Petra”. Malle Piet has any background or be made up in any colour. He might frighten kids a bit by threatening to put disobedient kids into a sack and carry them to Spain, but perhaps we must reconsider this too. The modern Funny Pete makes children laugh – perhaps by being a bit silly at times, but mostly by good jokes, perhaps when Kidda Claus is being a bit silly. This year Holland has a fierce debate about Zwarte Piet. See e.g. the Volkskrant newspaper today. The singer Anouk, whom I reported upon earlier, argued for abolishing Zwarte Piet but was hit by a tsunami of hate mail. The United Nations Human Rights has a Working Group of Experts on People of African Descent, and its chairperson Verene Shepherd has written a letter to the Dutch government asking what is being done about complaints on discrimination. The Kidda Claus festivity is meant to be a joyful event for children but can be traumatic for kids of non-Caucasian background when other kids call them names like “Zwarte Piet”. Perhaps the Dutch government can report that they have been neglecting a good suggestion since 1992. 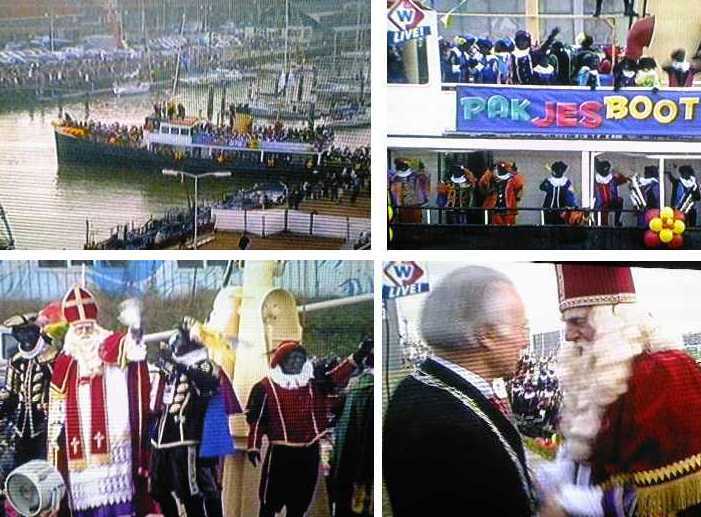 Below are some tv screen shots from the arrival of Sinterklaas and his Zwarte Pieten in Scheveningen harbour, last Saturday. He is welcomed by Jozias van Aartsen, the mayor of The Hague and former minister of Foreign Affairs. It would be incorrect of the Dutch government to hold that it is only a people’s celebration and that there is no official involvement. This is a close up, and notice the blackface & black minstrel make up. 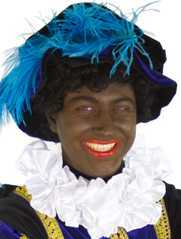 A woman dressed up as Zwarte Piet still is called “Zwarte Piet”. Children don’t quite notice that “Piet” is not commonly a name for a woman. At a certain age, they grow aware of the inconsistencies but then develop a taste for making mockery presents and poems. 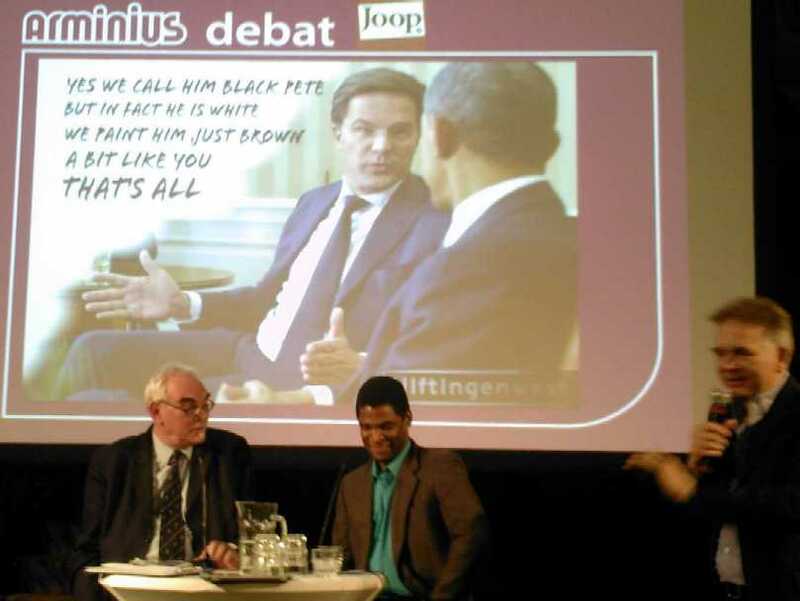 At a discussion by Joop.nl and Arminius in Rotterdam, the screen showed a satire of Dutch Premier Mark Rutte who explains Black Pete to President Obama. Compliments to the satirists Ulftingenwest. Dutch readers might look at my review of that discussion in Rotterdam. Holland seems to be stuck in a debate about abolishing YES or NO, while it would be much better to make a few but crucial evolutionary changes. In fact, listen to “How do you make a teacher great ?” TED 2009. It is quite a bold claim but there is some element of truth in it, while it helps to be so ambitious. While you are at it, perhaps also consider the Wall Street Journal interview and the TED 2013 lecture that teachers need coaches and feedback (other than from students). The same November 9 2013, I had a presentation in workshop D5 of the annual Dutch Teachers of Mathematics Day. My presentation was on the algebraic approach to the derivative, see the slides, the YouTube lecture and the book Conquest of the Plane. Some mathematicians are aware of an algebraic content in the derivative, see for example here, but they still stick to the use of limits. The new notion of “dynamic division” removes the need for limits and greatly simplifies and clarifies calculus. The discussion on the derivative links up with my earlier blog on the mathematical constant Archi = Θ = 2 π. The derivative generally gives the slope of a function, but the slope is also the tangent given by the sine / cosine ratio that depends upon the angle. Mathematical teaching requires re-engineering. Much in the highschool programme can be made more accessible to students. Society can advance when people have a bettter understanding of logic, finance, voting theory, and the distinction between model and reality. My original presentation was in Dutch and was split up in two sections of 15 minutes, with 5 minutes inbetween for questions and 20 minutes afterwards for discussion. The reception was OK, with serious questions and discussion, and modest applause at closure. Don’t expect teachers of mathematics to jump and dance on tables. It will take a lot of time before the new algebraic approach will be used in the schools and make math clearer for students. A comment by one of the teachers: Holland cannot change by itself, we have to stick to the world standard. My suggestion is that when math teaching is improved, so that students better understand math, then it should not be too difficult to explain what the world standard is and why it is so crummy. The Dutch king Willem Alexander (WA, 1967) will be busy next week. Most important is his visit to Russia and meeting with president Vladimir Putin (VP) on Friday November 8. This visit to Russia will be somewhat special since WA is likely the last remaining governing descendent of the Romanovs, via Anna Pavlovna (1795-1865). This year Russia and Holland celebrated a year of friendship but this celebration was marred by tricky incidents on freedom of speech and arrests and beatings in diplomatic circles. Dutch diplomats are crossing their fingers that Queen Maxima’s charm will cure all wounds. A bit less important than Russia but not to be discounted is the event on November 6, when WA will present the Erasmus Prize to Jürgen Habermas (JH, 1929). Undoubtedly, JH will inspire WA to some Erasmian message to VP, though diplomats will try to induce him not to press the issue. But WA might say to VP: “Dear president, a few days ago I presented the Erasmus Prize to JH. I enjoyed this very much. Perhaps it is an idea for you to create a similar prize in the name of a great Russian author or philosopher.” Who knows. JH will give his lecture Deliberative democracy and political crisis on the day before, November 5, at the Dutch Academy of Sciences, organized by the Huizinga Institute, with this programme and planned livestream. Some of his ideas are covered by an email-interview with the Volkskrant, this weekend (apparently not linkable), a book review, and here his book in English. My sad observation is that JH doesn’t add to enlightenment and only adds to the confusion. He is a Grand Old Man in social research and philosophy, but he is not a mathematically trained economist, and he cannot really evaluate what happens both in economic theory and in the real economy and thus in society. For his data, he refers to a report in Die Zeit with statements of “leading economists”. His main complaint is that European politicians dodge the real issues. As if we would not know that. As if we would not have a crisis because they dodge the real issues. As if you can trust “leading economists” and the process how the powers that be and the media select those. No, if you really want to understand the economic crisis and the failing of the Trias Politica model of democracy, read my books DRGTPE and CSBH and VTFD, see the about page here above. Please note that these books suffer from censorship of science, so that the discussion on November 5 at the Dutch Academy of Sciences is severely crippled. JH comes from a tradition that looks at high theory and that neglects to study the real world. He is part and parcel of a new class of priests like those who Erasmus poked at in The Praise of Folly (1509). Because of his fundamental neglect of reality JH is anti-Erasmian. The Dutch committee that awarded the Erasmus Prize to JH is similarly affected. JH supports fast European integration and the committee seems to associate this with the pro-European outlook of Erasmus. They neglect the shallowness and they fear real criticism of the European Project. A charade it is, a scandalous charade. A corruption of thinking and ethics, in mentally sick modern Holland. PM. There is another Romanov connection to Prince Charles, see here. But Charles doesn’t reign yet. 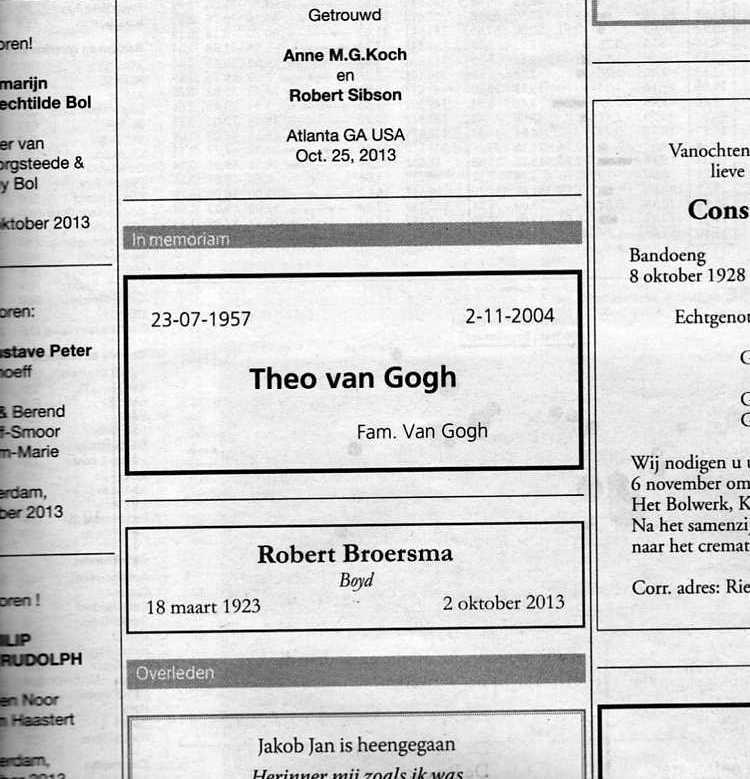 The Van Gogh family placed an In Memoriam announcement in today’s NRC Handelsblad newspaper, for Theo van Gogh 1957-2004. The filmmaker was murdered today nine years ago by a mentally confused islamic assassin. See the wikipedia page for more on this. A good way to remember Theo van Gogh is to study a bit of history to understand why such a mentally confused person can come to such an act of violence. A good place to start is with the book of Bernard Lewis, From Babel to Dragomans. Interpreting the Middle East, Oxford, 2004 as well. Since this is a collection of papers published earlier, you can select your topics of interest and develop an appreciation for the author and the subject mater. Once you start learning more then the other papers become of more interest too. A good place to start is with this critical review in The Guardian. PM. Dutch readers might want to see what I wrote in 2004 on Theo’s death. There I refer to the book Zonder Professoren which is a novel with a message that Holland still does not understand what freedom of speech really means. In 2004 that book was a pdf draft only but it has been published now in 2012 (no review yet).